Most electric car startups "have no idea what they're facing"
William Li isn’t your typical, boundlessly optimistic Chinese tech entrepreneur. 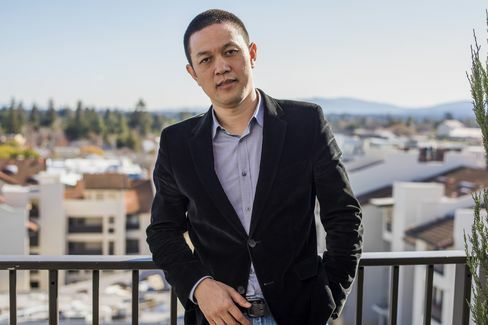 Yes, the founder of startup NextEV Inc. has big plans to disrupt China’s electric car market, the financial backing of venture capital powerhouses Sequoia Capital and Hillhouse Capital and considers Tesla Motors founder Elon Musk an inspiration. That said, he rates his chance of succeeding in China’s fast-moving car market at a whopping 5 percent. He also thinks most of the new business models for electric cars being bandied about by tech companies will end up in the junk yard. Such hard-nosed realism is probably wise. As global auto executives gather for the 2016 Beijing Auto Show, a torrent of money is pouring into the nation’s alternative energy vehicle market, which includes electric vehicles, plug-in hybrids and fuel-cell cars. In a country with some of the worst urban air pollution on the planet and a rapidly urbanizing populace, the market’s upside potential seems big to conventional car companies and tech startups jumping in. The Chinese government is promoting what it considers a strategic industry with big subsidies for companies and consumers. It wants new energy vehicle sales to top 3 million units a year by 2025, versus 330,000 in 2015. Premier Li Keqiang in February urged local government and industry players to speed up construction of charging facilities to accommodate 5 million electric vehicles by 2020. Right now, the electric car business is dominated by BYD Co., a Shenzhen-based automaker, 9-percent owned by Warren Buffett’s Berkshire Hathaway Inc., that has a 18 percent share of China’s new energy vehicle market. 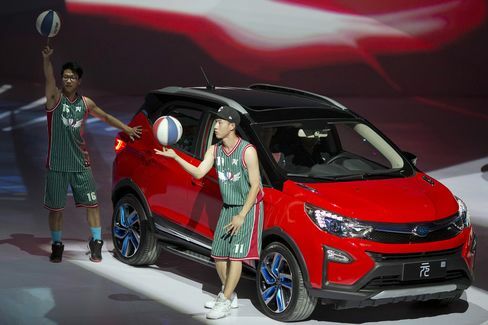 At the Beijing show, BYD will be touting its new entry-level sports-utility vehicle called The Yuan, as in the 13th-century Chinese dynasty, that starts from 209,800 yuan ($32,368) for the hybrid version. Performers take part in a event to introduce the Yuan, the latest Plug-in Hybrid mini SUV from BYD. Tesla is a player, too, in China, where it sells its Model S and Model X, though the Palo Alto, California-based electric carmaker would like to be a far bigger one. For the first three quarters of 2015, the company sold 3,025 vehicles in China, which compares to 11,477 units of delivery by BYD. The Chinese company, also sells its electrics in U.S., Germany and Japan and surpassed Tesla in May to become the world’s biggest maker of new energy vehicles last year. The success of Tesla in the U.S. and the development of driver-less car technologies by Apple and Google are also attracting all manner of technology companies into the Chinese auto market, the world’s biggest. Some envision cars developing into “mobility service platforms,” in which passengers receive data and services in addition to being moved from point A to B. That could play to the strengths of technology companies and the huge and growing Chinese auto market could be the perfect laboratory in which to experiment with new services and business models, according to Bill Russo, managing director at Shanghai-based auto consultant Gao Feng Advisory. Russo compares today’s autos to the mobile phones of a decade ago, when apps started to gain in popularity. “As cars become mobility service platforms, the technology on board will become more sophisticated,” he says. Technology companies could contract out auto production to make vehicles, but then earn recurring revenue by providing car owners with data products and Internet services. “Apple makes money not just on the device, but on all the services that flow through it,” he said. It’s definitely a vision in search of details, but plenty of technology companies are jumping into the fray. Electronics contract manufacturer Foxconn Technology, Internet service portal Tencent and China Harmony New Energy Auto have set up a joint venture to build alternative energy cars. The partnership is designed to leverage different strengths: Foxconn’s component supply chain, Tencent’s infotainment and telematics systems that could improve vehicle’s connectivity and Harmony Auto’s after-sales network for electric vehicles. In January, Daniel Kirchert, head of Infiniti in China, joined the alliance. Chinese tech billionaire Jia Yueting also has automotive ambitions. The chairman and founder of Le Holdings Co., which makes Web-enabled televisions and smartphones and offers cloud and e-commerce services, is a major investor in Los Angeles-based Faraday Future, which is building a 900-acre factory near Las Vegas, Nevada. LeEco, which has developed its own electric vehicles, is preparing to apply for a production license in China and also plans to manufacture its cars overseas. Given all the new entrants, it is easy to understand why NextEV founder Li is wary of the competition, even with financial backers like Sequoia. Li has hired former Cisco Systems Inc. Chief Technology Officer Padmasree Warrior to lead development and U.S. operations and has inked a deal to outsource production to Anhui Jianghuai Automobile Co.
Li’s early life didn’t fit the profile of a tech entrepreneur. He spent his early years herding cattle in a mountain village in Anhui province, where he grew up with his grandparents. A talented student, he left the rural China to attend the prestigious Peking University, where he earned a degree in social sciences while supporting himself with part-time work like selling office supplies to Apple Inc.
Before starting NextEV, Li co-founded and built Bitauto Holdings Ltd. into the country’s biggest provider of online car pricing data for dealers. The company went public in New York in 2010. Li and Bitauto have invested in more than 40 companies in China including used-car business, financing services and car-sharing platform such as Didapinche. Li says NextEV is an opportunity to rethink the electric car as not just a transportation vehicle but as a digital platform. NextEV has produced an electric Formula E series racer, but hasn’t yet disclosed its plans for launching an electric car aimed at the consumer market. Meantime, the race is engaged by a gaggle of tech companies to prove they can be players in Chinese autos.